If you were to move into Newington in 1871, and you were a Catholic, you would have immediately encountered the overwhelming difficulty of attending Sunday Mass. This was because there was no Catholic church in Newington. 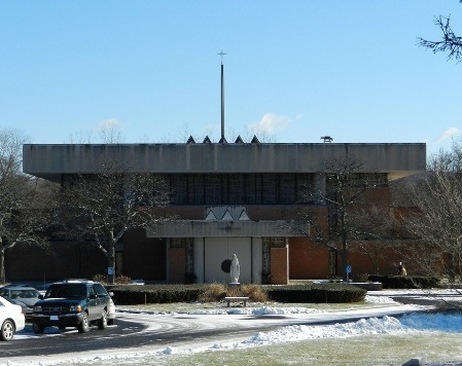 After much discussion in town, Mr. Thomas F. Garvan made a decision and arrangements were made for St. Bridget's Parish to have a mission church in Newington near what is now the Mill Pond area. On Sunday, June 6, 1920, the tiny edifice was blessed and dedicated to Mary, the Mother of God, and the first Mass in St. Mary Mission Church was celebrated by the Pastor of St. Bridget's, Rev. William F. Odell. In 1925, St. Mary was established as a separate parish of its own, and Rev. 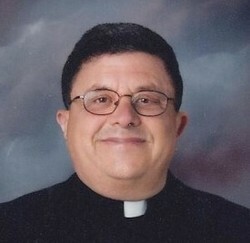 Edward H. Shaughnessy was assigned as their new priest. As the parish continued to grown and age, time came when thoughts of a new church began. This Diocese of Hartford was able to purchase a parcel of land from then parish trustee, Peter E. McGuiness. The erection of the second Saint Mary Church began and celebrated its first Mass in November 1931. In 1935, St. Mary's Parish was given a surprise gift from Daniel Shea, who was a Navy veteran of World War I. He was confined to bed due to an illness that left him paralyzed and blind. His condition did not allow him to leave the Veterans Administration Hospital but for one or two times a year. Feeling joy and consolation he received from church, he decided to give a bell to St. Mary Church. Therefore, as the bell summoned everyone to Mass, he too could attend in his own way. The bell was engraved with the inscription "To the Glory of God and in Loving Memory of my Mother - Daniel F. Shea - Christmas, 1935". It was blessed by Bishop McAuliffe on January 12, 1936. The bell was hung and used to announce the beginning of Mass while Daniel was moved closer to the window of the hospital to hear the sound of his gift that he would never see. During the Mass, one single peal announced to Daniel the elevation of the Host and another for the Chalice. Daniel F. Shea passed away only 8 months afterwards on September 15, 1936. As Reverend George F. Clark became pastor of St. Mary Church, he felt distant to his parish because of living in West Hartford. He felt he could serve the parish better if a Rectory was built for him to live in. This construction was complete in September 1939, lifting St. Mary Church to full status with its own Pastor. Father Clark passed away in December, 1956. St. Mary's Parish continued to grow under Reverend Joseph F. Buckley. St. Mary's Junior High School was constructed along with the convent in 1958. This gave our parishioners great pride in being able to offer Newington children a parochial education. More fundraising efforts took place over the next decade to keep up with the growing parish, beginning with the present-day Rectory and Church, which were completed in 1961 and 1967 respectively. Father Buckley retired in 1970 due to health concerns. St. Mary Church has continued to prosper and flourish under the leadership of the following Pastors, while today offering spiritual direction to over 1900 families.